How important are your vinyl cutter blades? Think of it this way. Your cutter may be a basic model or a sophisticated contour cutting, digital dynamo. All of that power and precision is channeled to your vinyl through the blade. So if you’re using the wrong blades, or if you’re using worn-out blades, or if your blade is installed incorrectly, all of that power and precision is nullified. If you use the right blade, install it correctly, and maintain it, you get to enjoy all the benefits your vinyl cutter can deliver. Think of your blade as the conduit of quality. To help you get the most out of your plotter’s performance, we offer this Plotter Blade FAQ. Are blades interchangeable from one brand of cutter to another? How much of the blade tip should be exposed? 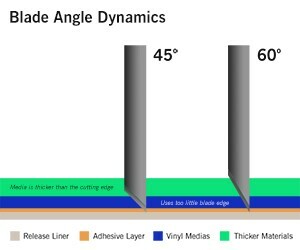 What blade angle should you use for different types of vinyl? How often should it be replaced? 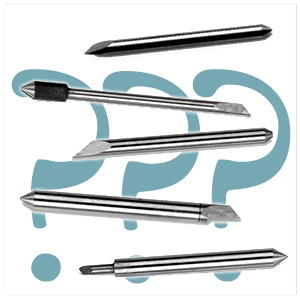 Just for the record, we’re also talking about knives and needles; two other terms for plotter blades. Whether you call them blades, knives or needles, the answers to all your cutting questions are found below. Does it Matter which Brand I buy? Generally speaking, vinyl cutter blades are not universally compatible. The blade has to fit snugly in the blade holder and the blade holder has to fit snugly in the tool carriage. So whether you’re purchasing a new blade or blade holder, you have to make sure it’s compatible with the brand of cutter you’re using. Graphtec cutters use Graphtec blades, Roland cutters use Roland blades, Geber cutters use Geber blades and so on. The exceptions come when you move beyond the top tier brands into newer manufacturers. Once upon a time, the top-selling vinyl cutter in the country was the Roland Camm-1. At that time, a lot of new companies like GCC were trying to break into the market. So they decided to make their products more appealing to consumers by designing their plotters to be fully compatible with Roland blades and blade holders. This is why our EnduraBlades fit a fairly wide variety of cutters including Vinyl Express R Series, EnduraCUT series, Vinyl Express BobCat, Lynx, and Panther cutters, and all Roland plotters. How Much of the Blade Should be Exposed? Fig 1. Only extend enough of the tip to penetrate the face film and adhesive layers. Whether you’re buying and installing a replacement vinyl plotter blade or installing the OEM blade in a brand new cutter, the first thing you have to know is how much of the blade should be exposed. If you have enough blade sticking out to clearly see and feel the tip, it’s probably too far out. Most new vinyl cutter owners improperly install the blade with too much of it protruding from the holder. Set it so that you can barely see the tip. Then take the blade holder and manually drag it across a sheet of vinyl making a box pattern or square. You should be able to weed that easily, but you shouldn’t see deep scoring of the release liner. If you flip the vinyl over, you should not be able to feel the cut line in the back of the liner. If you can cut vinyl manually without carving up the liner, you’ve gotten it right (Fig1). Now install the blade holder in the tool carriage, adjust the cutter’s force setting, and perform a test cut. Tweak the cutting force until you get the same result. The only time you need more blade tip exposed is when you’re cutting very thick material like heat transfer flock or sandblast stencil film. Otherwise, use the ‘less is more’ rule. Which Blade for What Vinyl? Fig 2: A 45° blade works for most media. For thicker or tougher materials, a 60° blade is more effective. Here’s the $60,000 question. Which blade should you use for which vinyl? The three most commonly used plotter blade angles are 30, 45, and 60 degrees. Many manufacturers only use 45 and 60 degree blades. Time for a little geometry refresher. The angles are referred to in terms of degrees because the cutting depth is determined by the angle of the intersection of the cutting edge and the shaft. (Fig 2). For standard sized graphics in most calendered PVC vinyls, a standard 45° blade works fine, if correctly installed (see above). If you have a 30° blade option, use that for standard sized graphics in thin films like cast vinyl and ORACAL’s delicate 1mil 352 chrome. For standard sized graphics in thicker or tougher films like retro-reflective film, sand blast stencil, or flock, a 60° blade is recommended because it cuts more deeply into the film. All of these fit in the same blade holder. The only difference is the angle of the tip. What about super-dense, diamond-grade reflective? Some high intensity prismatic reflective films, such as Nikkalite Crystal Grade reflective, cannot be cut with any plotter using any blade. For 3M 3930 diamond grade reflective, special blades are recommended. If you’re reading your Graphtec or Vinyl Express Q Series users manual, you may be a little confused. Rather than using various blade angles in one blade holder, Graphtec’s approach to thicker materials is to throw a bigger blade at them. The standard 45° blade in a Graphtec-made plotter has a 0.9mm shaft and fits in a blue-topped or blue-capped blade holder (Fig3). Graphtec’s OEM solution for cutting reflective vinyl and sandblast stencil is a thicker 1.5mm blade in a red blade holder. So if you’re in the Graphtec camp, when you load a roll of reflective, you’ll remove the entire blue-tipped blade holder and drop in a red-tipped holder housing a robust 1.5mm blade. Unfortunately, neither the red blade holder nor the beefy blade come with the cutter. The blades are sold in packs of two or five. A pair of 1.5mm blades and the CB15U blade holder cost about $220.00 combined. So the Graphtec “red tip” blade holder solution costs a little more, but it gets the job done. Naturally frugal sign shop owners request more economical options and the aftermarket industry has supplied them. For those who want to cut reflective and other materials in a Graphtec or Vinyl Express Qe or Q series plotter, the economical option is to use an aftermarket 0.9mm blade with a 60° angle. Those are only $14.00 each or five for $50.00. What is a Flock Blade? “Flock” is a specific kind of cuttable thermal transfer film, aka “T-shirt Vinyl” that’s used to simulate the thick, velvety feel of a letterman sweater. 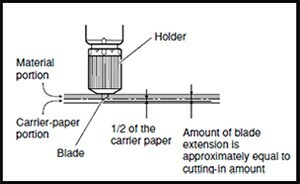 Because of its thickness, a 60° blade is required for cutting flock. Hence the term, ‘flock blade’. However, the majority of thermal transfer films used are extremely thin and soft – comparable to 2mil vinyl. For standard films like HotMark, QuickFlex, or Easy Weed, a standard 45° blade is fine. For flock or reflective heat transfer films, use a 60° blade. What About Window Tint Film? Window tint film is typically 2mil or thinner, and doesn’t have the benefit of a Kraft paper release liner, so a 45° blade cuts too deeply . Graphtec and Vinyl Express Q Series users have the option of using a specially manufactured blade offered by Tint Tek 2020. The TintTek blade has a special angle optimized for precisely cutting window tint film and fits the standard 09U Graphtec blade holder. Roland users should opt for the CS125 25° blade. Astute readers probably noticed above that my recommendations for 30, 45, and 60 degree blades were all for “standard sized graphics”. That’s because trying to plot very small, finely detailed fonts poses a different challenge. When a font gets down to about a half inch, certain parts of it are so tiny that the rotation of a standard 45° blade causes the edges of the vinyl to lift as the letter is being cut. It’s like trying to mow around a sapling with a standard riding mower when you need a “Zero Turn” tractor. This is an annoying problem sometimes referred to as ‘vinyl ears’. In this case, switching to a 60° blade works by effectively tightening the rotation of the blade tip in the holder. It also reduces the size of the blade’s cutting edge. The result is a precisely cut graphic with no lifting edges. What about Replacement and Maintenance? How long does a normal blade last? There’s not a standard lifespan for plotter blades. As the EPA says, your mileage may vary. It depends on how much vinyl you cut, and what kind of materials you cut. The glass beads and metal flake used in reflective and metallic films dull blades more quickly than standard PVC vinyls. And, as noted above, how precisely you set your blade for the materials you cut affects its service life. Choosing and using your plotter blades wisely are easy but essential steps for professional sign making. Choose the right blades for your plotter. Install them correctly and choose the right blade angle for the job. Keep an eye on wear and be ready to swap in a fresh one when cutting quality declines. Do this and you’ll get optimal performance from your high speed, high powered, high tech vinyl cutter.